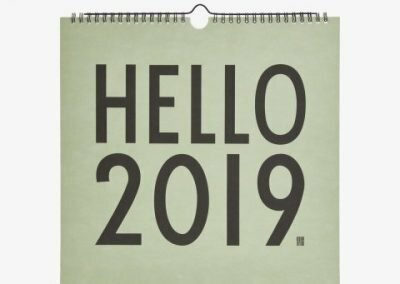 Welcome to the first post in a two-part series on the steps you need to take and consider when you want to take a blog and turn it into a book. In this first session we’re going to just talk about some of the basics that you need to think about if you’re considering repurposing the content that you have on your blog. It’s not as simple as just cutting and pasting. It’s important to consider the different steps that need to be planned in advance and executed to produce a compelling book. What is Your Book’s Purpose? First of all, consider that there are a variety of reasons for writing blogs in the first place; your blog might be intended to entertain, to inform, to inspire, or to educate. But there needs to be more to writing your book. You need to go a bit further to sustain interest in a book-length project. You need to address some basics, which is what we’re going to talk about today–just some basics that determine your purpose for the message that you want to publish in book form. According to literarydevices.net, a subject is a topic that acts as a foundation for a literary work, while a theme is an opinion, expressed on the subject. That’s why it’s so important to clarify in your own mind what your theme is. 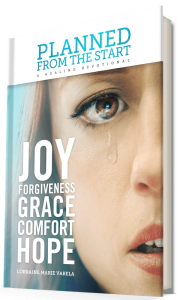 One subject for my book could have been “my life has been hard,” while a theme would be, “my life has been hard but God has redeemed all the pain.” The second option is absolutely the theme of my memoir, “Full Circle: Coming Home to the Faithfulness of God.” Yes, I went through lots and lots of very traumatic and troubling and just extreme situations that God did redeem and so that’s really the theme of my project, but it definitely could have gone in any one of several different directions. Think in terms of the theme you want to feature as you decide which blog posts you want to include in your book. Think about what the main conflict would be, because there’s got to be some conflict that engages your reader. There’s more—much more—to turning your blog into a book than just loading your posts into a formatting program and hitting publish. But that’s true for any sort of publishing. You can’t just type a document and upload it – well I guess you can but that’s usually, in fact always, a recipe for a disaster. We’re usually way too close to the material to be able to ensure that what’s in that document that we’re uploading is quality and polished. Although writing a book based on your blog posts may be more work than you had anticipated, there’s still a huge advantage to this approach in that you’ve got a solid foundation already in place on which to build your book. You may have even received valuable feedback from your blog readers in the form of comments and emails that will help you write your book. The third step in this process is to choose a relevant working title. That will help narrow down your theme. And bear in mind that the title should elicit interest in the book and should be compelling, not boring. Here’s my progression: My blog was called, “Not Afraid to Tell my Story.” That could mean a lot of things, but that was the title of my blog. So then I had to think about whether I wanted to focus on the deception and the spiritual abuse, or whether I wanted to focus on my not dealing with my own woundedness and my own struggles and trauma in my life, and how that made me vulnerable. I could have taken my theme in any number of directions. 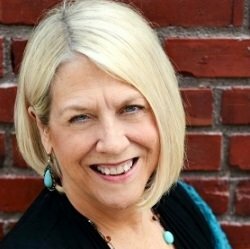 At first I thought I might focus my theme on my detour into deception, how to avoid false leaders and spiritual abuse, and that could have worked. But I realized that I needed a coach to help me process and think through what made the most sense and what would glorify God the most. The theme I finally chose was “Full Circle: Coming Home to the Faithfulness of God.” Because even though I had experienced spiritual abuse, and even though I had experienced trauma and abuse in my life as a younger person, and a lot of different experiences that wounded me, the truth is God was faithful through it all. So I decided to use the more positive, hope-filled title. This made a lot of sense, and I’m glad I chose this approach. The fourth step to getting ready to turn your blog into a book is to determine your angle. Is your blog largely about one topic? If it is, that’s going to make it easier for you to write your book. Or does your blog cover multiple, unrelated or loosely-related topics? If it’s covering many different topics, like a hodgepodge of different areas that you’re covering, you need to find an overarching theme that runs through the posts. That’s what my coach and I did with mine. I talked about so many different areas of processing through, such as my 12 years of deception and seeing the unhealthy behavior and understanding the spiritual abuse, and seeing all these connecting dots and all the stuff. But the overarching theme was that God was faithful to deliver me and God was faithful to show me and so that was an overarching theme. If you have a number of different topics that you’re blogging about, ask yourself whether there is an overarching theme that you can tie together. The most effective theme. You don’t have to incorporate everything you’ve ever blogged. You want to find the best posts that communicate that overarching theme. Then the last step is to create a plan based on that theme. As you’re looking at all of your content, develop a table of contents and maybe even a small outline. If you’re not much of a planner, don’t worry. I am a “pantser.” I fly by the seat of my pants. I just write whatever God shows me in the moment to write. I am not a planner. That’s just who I am. But in this situation, if you’re really seriously thinking about repurposing your blogs and turning them into a book, you need to have a plan and come up with something from your end, and understand – it may change. But at least start with something that gives you a direction to go. Every book has a beginning, a middle, and an end, and that’s important to get that down on paper. Begin to take the different posts that you have and marry them with a chapter in the beginning, the middle or the end. Those are the first five steps toward turning your blog into a published book. There’s much more information to cover. To give credit where credit is due, a lot of this actually came from a class taught by my senior editor, Inger Logelin, who helped me with my blog and with turning it into my memoir, Full Circle. She covered a lot of this at the Northwest Christian Writers Renewal here just a couple weeks ago. In closing, know that there are three ways to approach taking a blog and turning it into a book. The first approach would be just do it on your own. Just get in there and figure it out. I thought about doing that with my book, but I was too close to the content. I really had a hard time. I was not very objective. The second way to approach it is with a coach walking you through it, and I am a total fan of having a coach walk with you and help pull out of you what’s going to make the best product. And I could have gone that direction, just having Inger coach me through putting those articles and blog posts together, figuring out which ones to use and which ones not to use, and going from there. But because I was so busy, I really did not have time to do that. The third way to approach it is to actually contract a writer to collaborate. Hire someone. We have editors and writers who can do that for you. 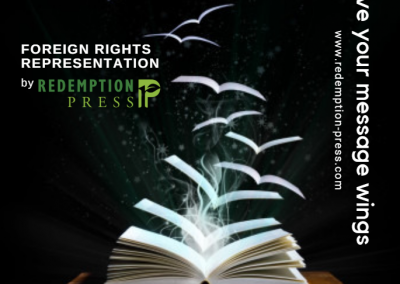 If you are a Redemption Press author or you want to be, having someone take all of the information, take all of the blog posts, look through all of it and come up with that plan, the outlined theme, and make some recommendations, and actually put the content together and then go back and forth with you as the person who’s gone through the experience. That collaborator needs to work closely with you to learn the details that will make the different scenes come alive. And that’s what I did with my coach and editor, Inger, and it was amazing. I mean it really was a lot less work on my end and at that point, that’s what I needed to do. There’s nothing wrong with having someone act as a collaborator, ghostwriter, whatever you want to call it. It was all my content, my story. Fortunately, Inger knows my voice. We’ve worked together for more than 25 years, so it wasn’t hard for her to put something together that didn’t need a lot of changes from me, because she knows my heart, she knows my voice, she knows my story. It was a good fit. 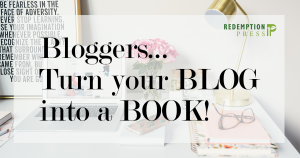 So let me just say if you are thinking about taking your blog and repurposing that content into a book, we would love to talk to you about it, love to help you figure out the best way to approach it. So please feel free to connect with us through our website at Redemption-Press.com or you can even make a comment below this post, and we will respond and schedule a time to connect to see how we can help you do that. And stay tuned, because next week we are going to go into the second part of this series to elaborate on some of the other things you need to be thinking about when taking your blog posts and turning them into a book.